I made this tamale bake tonight, and it was great. I topped it with some guacamole! I love this recipe – i will definitely make this sauce again and play around with different fillings. I think adding some seitan chorizo would be great! Make enchilada sauce. In a high-powered blender or food processor, add all enchilada ingredients. Blitz until smooth. Set aside. Make the filling. . De-stem the kale and chop into small, edible pieces. Drain and rinse black beans. Preheat oven to 375°. Into a skillet warmed on medium heat, add 1 tablespoon of oil. Add in the butternut squash and sauté for 5 minutes, stirring occasionally. Salt to taste. Add in 1/3 cup of the enchilada sauce. Cover and cook for an additional 2-3 minutes until just barely ready. Just warm it up. Add in the kale, black beans, and additional tablespoon of oil. Cook for another 3 minutes. Salt to taste. Remove from heat. Stir in 2/3 cup more of enchilada sauce with 1/4 cup of cheese (more if you like things cheesy). Use the skillet as your baking pan, or place in an 8″ x 10″ pan (or something similar in size). Make the topping. Add the pre-cooked white or yellow corn meal to a bowl. Stir in the warm water a kosher salt. Crumble evenly over the pan and press out until flat. Top with remaining enchilada sauce. Bake for 25-30 minutes. Garnish with cilantro and avocados. Serve. Ive confessed before I have a mad love affair with brussel sprouts. And I’ve seen them on pizza. So i gave it a try, after finding THIS siracha and roasted garlic bbq sauce at trader joes. (this sauce also works great for making baked tofu, but thats another story. First of all, this is my go to pizza crust. Serioulsy. We used to buy whole foods pizza crust all the time, but at $3 a crust, we realized that this is so much cost-efficient, and its so so great and practically foolproof, especially if you have a stand mixer. This recipe comes from the joy of cooking and its all over the internet. Combine yeast and warm water in your stand mixer and let stand until yeast is dissolved, about five minutes. Mix all ingredients on low speed for about 1 minute to blend all the ingredients. Knead for about 10 minutes by hand or with the dough hook on low to medium speed until the dough is smooth and elastic. Transfer the dough to a bowl lightly coated with olive oil and turn it over once to coat with oil. Cover with plastic wrap and let rise in a warm place (75 to 80 degrees) until double in volume, 1 to 1 1/2 hours.Preheat oven to 475 degrees F. Grease and dust 2 baking sheets with cornmeal.Punch the dough down and divide it in half. Roll each piece into a ball and let it rest, loosely covered with plastic wrap, for 10 to 15 minutes. At this point prepare the desired toppings. Flatten each ball of dough 1 at a time on a lightly floured work surface into a 12-inch round, rolling and stretching the dough. Place each dough circle on a prepared baking sheet; if using a baking stone, place them on baker’s peels dusted with cornmeal. Lift the edge and pinch it to form a lip. To prevent the filling from making the crust soggy, brush the to of the dough with olive oil. Use your fingertips to press dents into the surface of the dough (to prevent bubbling) and let rest for about 10 minutes. The pizza is now ready to be topped. After topping bake until the crust is browned and the cheese is golden if using cheese). This takes about 12 minutes. Remove from the oven, slice and serve at once. And you can lightly coat a dough ball with olive oil, put it in a zip-loc bag and either refrigerate it for 1 week or freeze it for 1 month. Just thaw in refrigerator for one day, take out and roll. If doing this you can prepare the dough and put directly into the refrigerator (it will slowly rise). Then just take it out, roll into a round and let rest for about 10 min before baking. Cheddar daiya cheesePrepare your dough as stated above; Saute your brussels and onions. 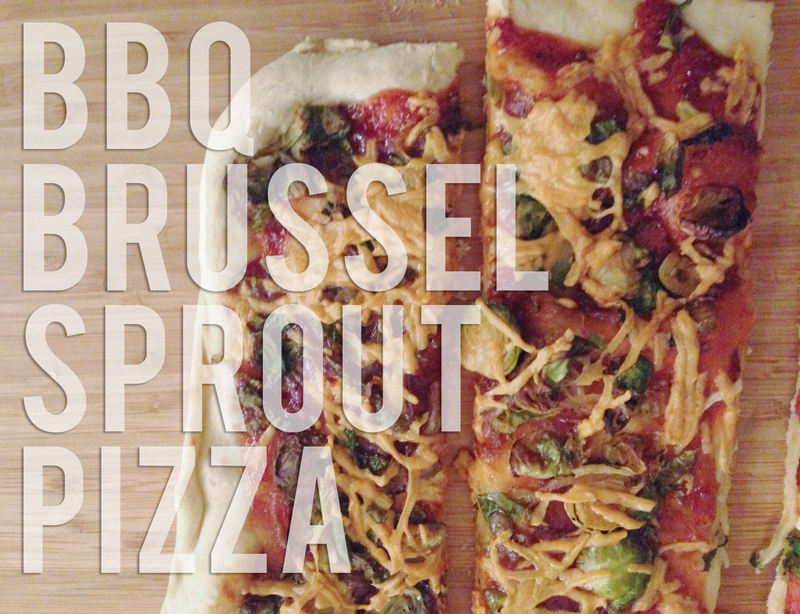 Top your dough with bbq sauce , then the brussel sprouts, onions and cheese. Bake as advised above.